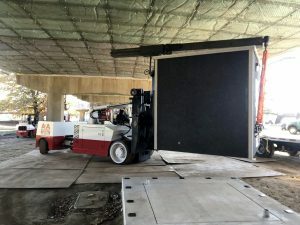 Picked the prefab building from over-top using a 60/80 Versa-Lift forklift to remove from the trailer and place in location under the Commodore Barry Bridge in Chester, PA. 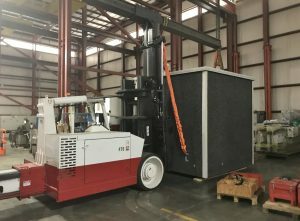 Eliminating the need for our customer to hire and manage multiple contractors and the headaches that can about with that, we managed multiple specialties from the warehousing and transportation, to the rigging and installation. From start to finish, we provided our customer one point of responsibility and communication. 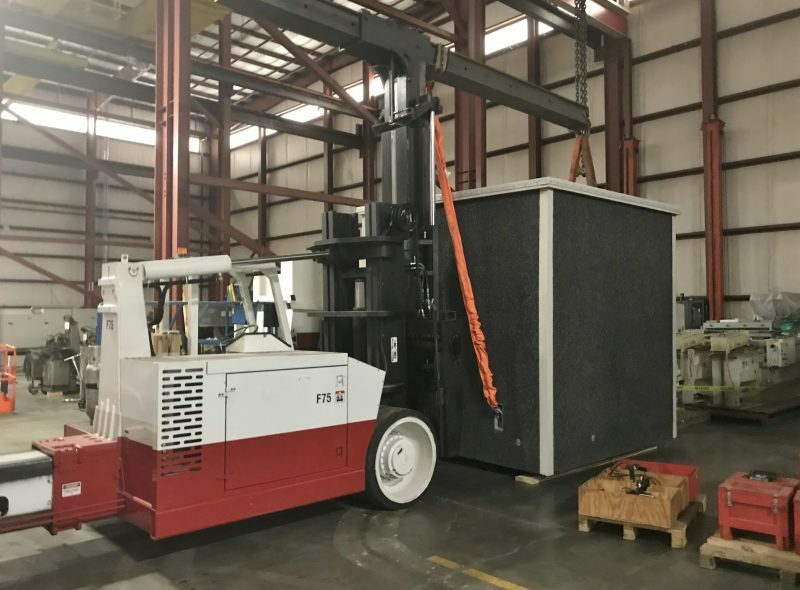 A&A Machinery provided turn-key rigging services for a local electrical contractor to store, deliver, and install a 55,000 lb. prefabricated communications building under the Commodore Barry Bridge in Chester, Pennsylvania. Our crew test-picking the prefab communications building at our warehouse prior to delivering to the job site. To accommodate the customer, A&A provided warehousing for the prefab building until the project schedule permitted delivery to the job site. The communications building was received by us directly from the manufacturer and stored at our warehouse in Morrisville, Pennsylvania. Due to the lack of overhead space at the job site under the bridge, a crane would not possible to pick and remove the prefab building from the truck. 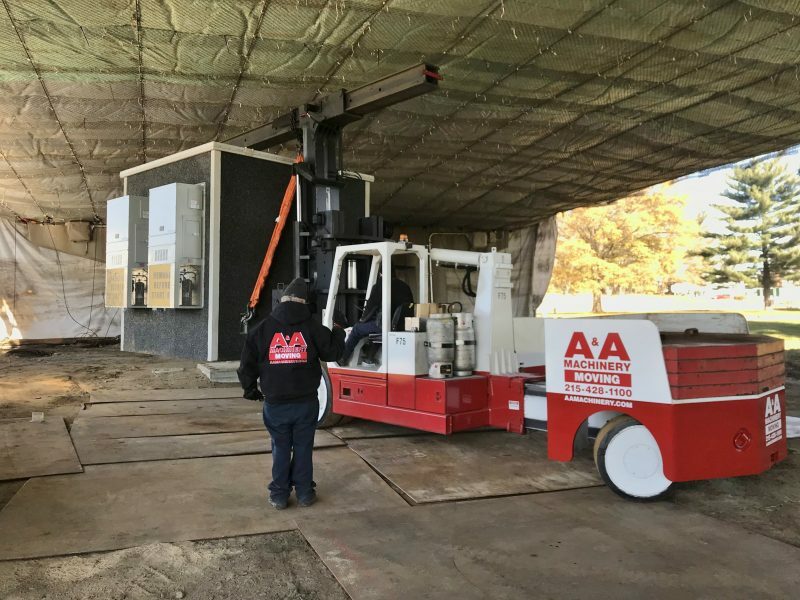 With the prefab building being stored at our warehouse, it allowed our team to do a test pick of the prefab building prior to delivery to the job site. The prefabricated communications hut exterior dimensions were 10 ft. x 10 ft. The hut required over-dimensional permits, which A&A arranged along with transportation along Interstate 95 to the job site. Setting the prefab communications building on the concrete pad under the Commodore Barry Bridge in Chester, PA.
To give the 60/80 Versa-Lift a smoother surface to travel and operator on, the A&A crew laid down steel plates in dirt areas that surrounded the concrete pad the prefab communications building would be installed on. 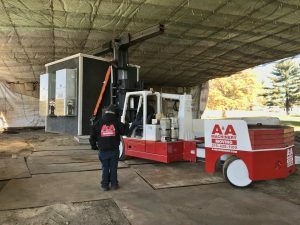 The Versa-Lift equipped with a hydraulic boom attachment and four counterweight slabs picked the prefab communications hut from over-top and removed it from the trailer, placing it on the concrete pad. 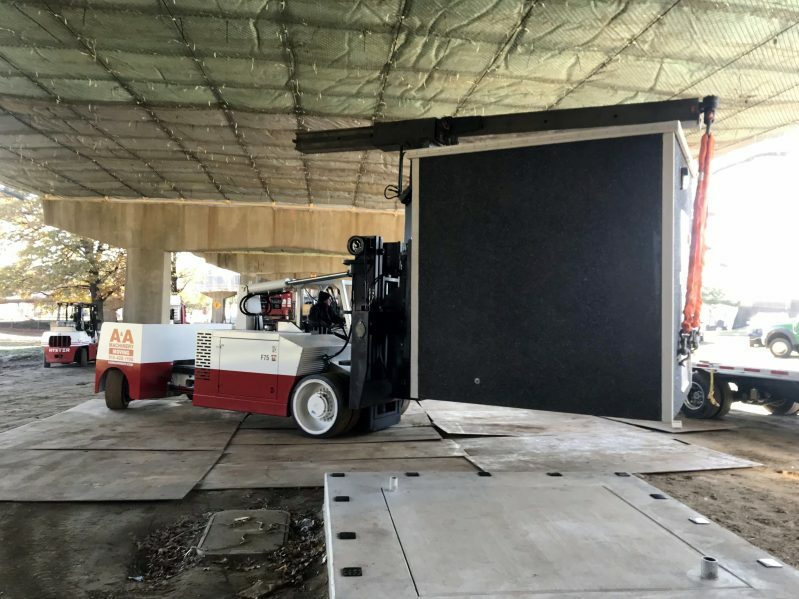 Since using a crane under the bridge was impossible, the Versa-Lift gave our crew “crane-like capabilities” to pick from over-top and remove the prefab hut from the truck. Our crew used 4 slings, rated at 13,200 lb. each, and connected to four 8 ton shackles to the factory lifting eyes on the walls of the prefab communications hut.